*A librarian friend lent me this ARC, because I am a huge fan of McCafferty. I hope it doesn't disappoint! Goodreads says, "When a virus makes everyone over the age of eighteen infertile, would-be parents are forced to pay teen girls to conceive and give birth to their children, making teens the most prized members of society. Sixteen-year-old identical twins Melody and Harmony were separated at birth and had never met until the day Harmony shows up on Melody’s doorstep. Until now, the twins have followed completely opposite paths. Melody has scored an enviable conception contract with a couple called the Jaydens. While they are searching for the perfect partner for Melody to bump with, she is fighting her attraction to her best friend Zen, who is way too short for the job. Harmony has spent her whole life in religious Goodside, preparing to be a wife and mother. She believes her calling is to bring Melody back to Goodside and convince her that “pregging” for profit is a sin. But Harmony has secrets of her own that she is running from. When Melody is finally matched with the world-famous, genetically flawless Jondoe, both girls’ lives are changed forever. A case of mistaken identity takes them on a journey neither could have ever imagined, one that makes Melody and Harmony realize they have so much more than just DNA in common." *I won this book through Random Buzzers. I may wait until next winter to read it though. Goodreads says, "I’ve left some clues for you. If you want them, turn the page. If you don’t, put the book back on the shelf, please.” So begins the latest whirlwind romance from the New York Times bestselling authors of Nick & Norah’s Infinite Playlist. Lily has left a red notebook full of challenges on a favorite bookstore shelf, waiting for just the right guy to come along and accept its dares. But is Dash that right guy? Or are Dash and Lily only destined to trade dares, dreams, and desires in the notebook they pass back and forth at locations across New York? Could their in-person selves possibly connect as well as their notebook versions? Or will they be a comic mismatch of disastrous proportions? 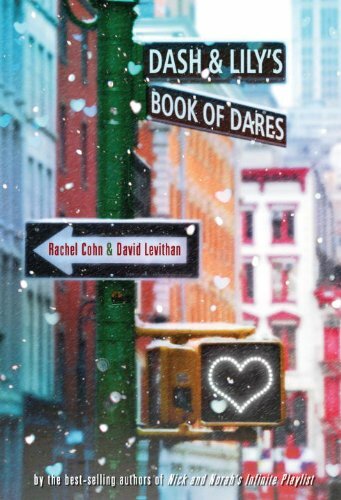 Rachel Cohn and David Levithan have written a love story that will have readers perusing bookstore shelves, looking and longing for a love (and a red notebook) of their own." *I loved Shade!! It definitely took me by surprise and I was excited to see this on S&S GalleyGrab. Goodreads says, "Aura’s life is anything but easy. Her boyfriend, Logan, died, and his slides between ghost and shade have left her reeling. Aura knows he needs her now more than ever. She loves Logan, but she can’t deny her connection with the totally supportive, totally gorgeous Zachary. And she’s not sure that she wants to. Logan and Zachary will fight to be the one by her side, but Aura needs them both to uncover the mystery of her past—the mystery of the Shift. As Aura’s search uncovers new truths, she must decide whom to trust with her secrets…and her heart." Dash & Lily is the perfect book to read in the winter! I would wanna wait too! I can't wait to start reading Shade and Bumped! I DEF suggest waiting to read D&L into winter. I read it a few weeks ago, and it definitely made me wish I still had my christmas tree up, and a cup of hot chocolate. I loved Dash & Lily, it was wonderful! I got Shift this week too. I enjoyed Dash & Lily's Book of Dares. It would be a good one to read over your Christmas break. I haven't read Bumped or anything by McCafferty. I look forward to your review. The premise reminds me a little of Wither. I REALLY want to read Bumped. I tried to get it on NetGalley but was turned down, probably because I've got a huge backlog on there. So disappointed that I couldn't get it, though, because it sounds amazing. I hope you enjoy it! Great set! I really want to read Bumped and the Cohn/Levithan book. You have Shift! ;is jealous; Can't wait to read that, Shade was one of the pleasant surprises for me last year, I enjoyed way more then I thought I would. All 3 of these books sound great! Now I have more to add to my list, exspecially Bumped! Ohhh Shift is my favorite that you got. I'm dying to read that. Enjoy all your other great ones too! Great haul! Bumped sounds amazing (I love dystopians!) 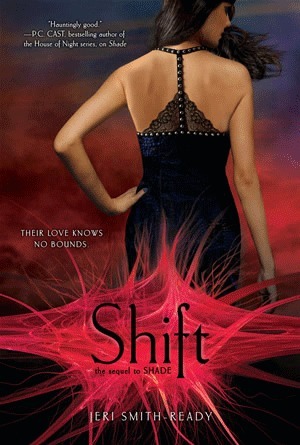 and the cover for Shift is very pretty! I can't wait to read it. I loved Dash & Lily's! I read it right before Christmas time and it made it even better to be in season :) I'm really looking forward to Bumped, too, especially since I'm doing a Dystopian Book Club with my students right now. You have an amazing mailbox this week! I have heard Shade is awesome, so I can't wait to see what you think of Shift:) I need to add both of those to my list for sure. Dash and Lilies' Book of Dares sounds really good! I didn't read their previous book though I did see the movie but didn't like it. Hopefully this is better. Ooh...mailbox post! Let's see...haven't read the first, curious though. The second....LOVE LOVE LOVE! Oh, did that come out too loud? Hehe. No seriously....it is SUCH a good read. It takes place around Christmas time, but um, it's always Christmas in your heart, right? (Just me trying to persuade you to read it sooner...did it work?) The third, haven't read the first one, eep! I really want to read Dash and Lily's Book of Dares but if I do I'll probably end up doing so over winter break. Enjoy!